R & V Art House is a firm founded by Robin Wahengbam and Dr Vijita Ningombam to create a platform for Manipuri artists so as to showcase their works at National and International levels and to grow as artists. The firm' s main objective is to help in preserving the art works of many unearthed and known talented artists of the state of the past, present and to take up step towards solving unemployment problems of artists of Manipur , and in the process, helping them grow in the global platform. Thus the R & V House intended to act as a stepping stone for promoting Manipuri artist. Along the above lines and congruently , the R & V Art House in collaboration with Manipuri Folk Music launched its art fête, the first of its kind under the banner "Manipur 's first book of Art / Art Fest 2018 at Hotel Imphal on 9th September 2018 which was inaugurated by the Hon'ble Speaker of Manipur Legislative Assembly Y Khemchand as Chief Guest. The theme of the Fest was - 'All art works are related to Manipur (environmentally focused , community based or dealing with critical issues related to the public )'. The fest exhibited works of 30 artists, the winner was awarded Rs 50,000 and the remaining 29 participants were awarded Rs 2,000 each respectively . Speaking at the event, Y Khemchand lauded the R & V Art House for organizing the unique event, the first of its kind in Manipur . "Although it is a small state with a small population, Manipur has many talented individuals. All we need is support. Therefore we should learn to appreciate each other 's talent and give positive feedback and positive criticisms," he said. Recognizing the efforts of art lovers, Y Khemchand said that he will extend his full support to develop and help the artist expose their works in International arena. 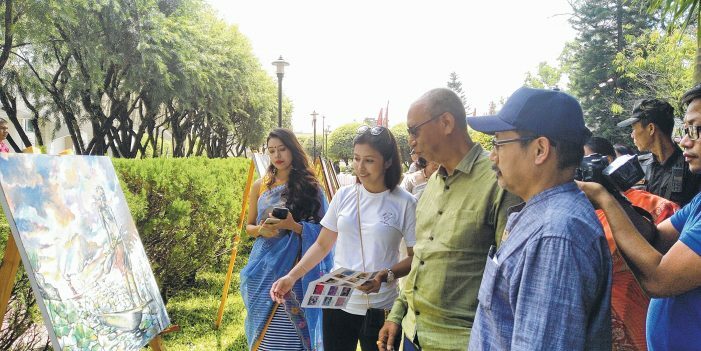 Co-founder Wahengbam Robin, a renowned artist of Manipur , expressed concern over the lack of books and documents on art history , origin and development of Manipuri art and said that he is in the process of filling the gap with experts and historians. Co-founder , Dr Vijita Ningombam in her speech said "Although it is a small state with a small population, Manipur has many talented individuals. All we need is support. Thus we should learn to appreciate each other 's talent and give positive feedback and positive criticisms," . Fine Art (Graphic) Professor Nirmalendu Das of Shantiniketan Vishwabharti University attended the event as a jury member as well as the president of the event held in Imphal. The firm' s next exhibition will be held in Mumbai, India followed by Florida, USA. They will also be publishing a book, Manipur's First book of Art which will contain history of art in the state as well as a compilation of works of contemporary artists. Co-Founder Robin is a well- known artist who has specialized in graphic art. He completed BFA from VisvaBharati University , Santiniketan. He has participated in a number of art workshops and camps. His artworks including paintings in various mediums have been exhibited in various state and national level art exhibitions organized by Academy of Fine arts, Kolkata and Manipur State Kala Academy , Imphal. As a creative artist, he has also designed the stage and ambience for Manipur Tourism Sangai Festival. Ambience and art installation for inter-cultural dialogue between North East India and South East Asia for IGNCA, New Delhi. Production design for Ford Foundation Production Film - 'Soldiers in Sarong'. He has also designed the mascot for the Vth National Games held in Manipur in 1999. He has been honored twice for UGC Educational Films in Animation and Graphic Art in 1998 and 1999. In 2011, he was awarded the Manipur State Kala award. His art collection has been spread around globe like the CARR for Human rights, Harvard Kennedy School, Cambridge, Massachusetts etc. It is his passion in the field of art that inspired him to have found R & V Art House along with Dr Vijita Ningombam. Dr. Vijita has a very well-rounded background that encompasses the creativity of art, the logic of science and the compassion of social work. All of these qualities inspired her to found R & V Art House along with Robin. Dr. Vijita' s interest in art began at a very young age. She has painted many canvases and competed at state and national level competitions. Her artwork was selected and published by The Hindu. At the age of nine, she acted in the Manipuri movie Khamba-Thoibi released in 1997, playing the role of Khamnu who raised little Khamba as a child. In 2003, she was a model for a documentary film called Phanek for Doordarshan and in 2008, she was the VJ for a TV show for NETV called NE Hi-fi Manipuri Music Countdown. She got offers to go into mainstream Bollywood, but instead chose a fruitful career in medicine. She graduated from Utkal University in Odisha in 2010 and later completed a fellowship in Cosmetic Medicine in Apollo Hospital in New Delhi. She is a social activist writer whose articles have been published in The Hindu, Indian Republic News Portal, Imphal free Press and E- pao.net. She also has a compilation of short stories and articles she writes in a personal blog. This article was webcasted on September 14, 2018.